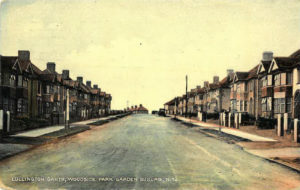 Most of the roads in Woodside Park are named after areas or villages in Sussex, where the area’s founder, Mr Fred Ingram, spent his childhood. 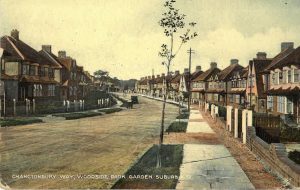 Southover, Northiam, Michleham Down, Shortgate and Arlington, which are surrounding streets in Woodside Park, are also villages in Sussex but these roads fall outside the sphere of Woodside Park Garden Suburb and are not, therefore, included in the list below. 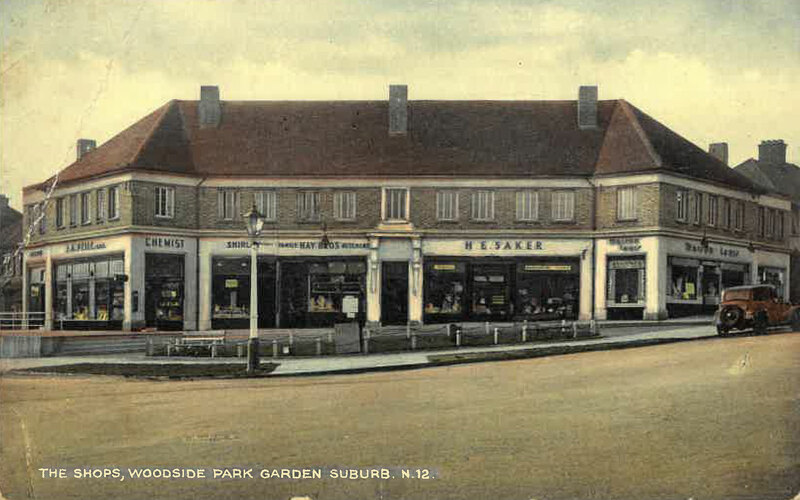 Sussex Ring is the shopping centre of Woodside Park and encircles the crossroads serving Argyle Road, Lullington Garth, Chanctonbury Way and Walmington Fold. 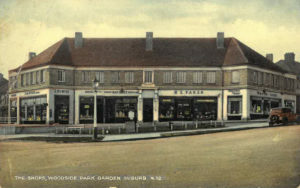 Sussex Ring was originally called The Shops. 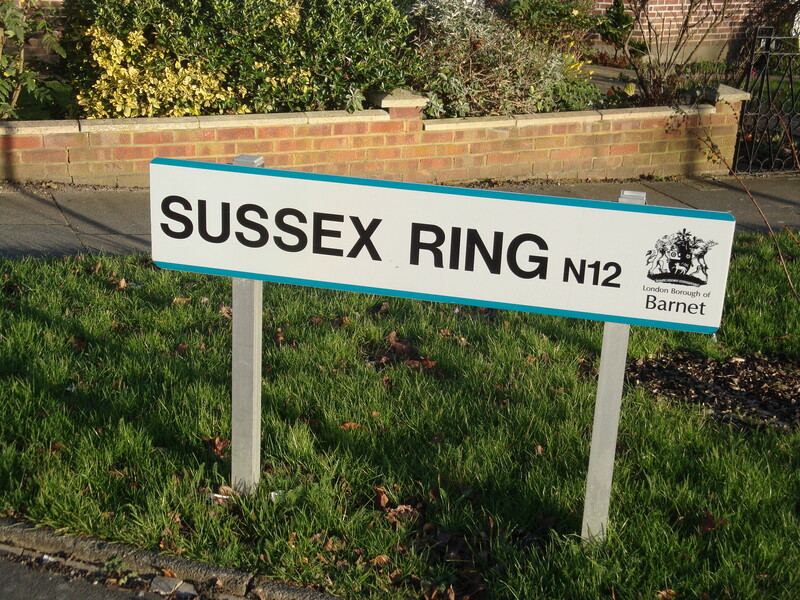 The name “Sussex Ring” did not materialise until the 1950s. 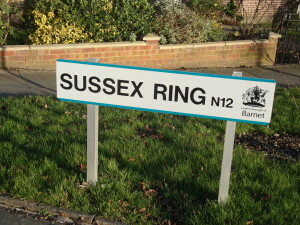 Exactly who named the cross-roads Sussex Ring is not known except, of course, it symbolises the county upon which most of the surrounding road names are based. 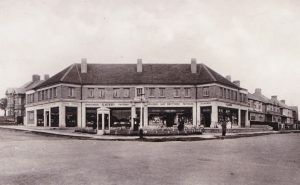 Sussex Ring presently contains eleven shops and seventeen residential units and houses. 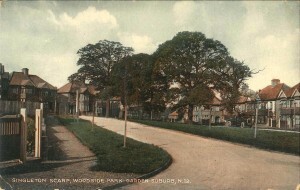 The bungalow at 8A Sussex Ring by Dollis Brook was originally established as the Site Manager’s house and during the Second World War became the home of the ATP warden. 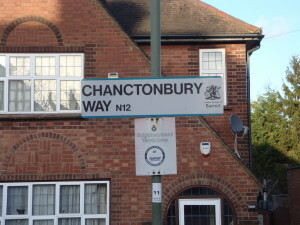 There are one hundred and sixty-seven houses in Chanctonbury Way numbering 1 to 174 except there are no numbers 13, 113, 165, 167, 169, 171 and 173. Chanctonbury Way is the longest street in the Suburb. Chanctonbury is not actually a village or town but a largish mound in the ground 783 ft above sea level. Chanctonbury Ring, as it is known, is one of the most important landmarks along the northern edge of the South Downs and is an Iron Age Hill Fort north of the Findon Valley in Sussex best known these days for a prominent clump of beech trees which are the subject of many paintings, postcards and photographs. A great deal of folklore is associated with the Ring. If you walk backwards or forwards seven times around the Ring on a dark or moonless night without stopping, the Devil will appear and offer you a bowl of milk, soup or porridge. The Devil is also credited with constructing the Ring, it being a clump of earth thrown from his spade when he was constructing Devil’s Dyke. There are rumours that the area is a venue for witchcraft and black magic. An altar was discovered in 1979 in the form of a five pointed star made of flints, all within a circle of flint. Between each star point were pieces of thick parchment bearing black candlewax. More recently UFO-gazers have been congregating at Chanctonbury Ring which has apparently become a hot-bed of terrestrial activity. 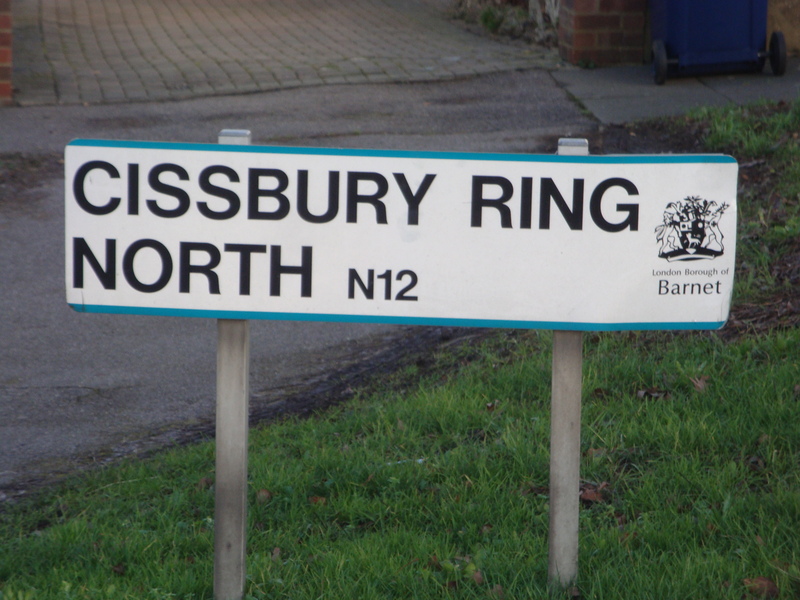 There are sixty houses in Cissbury Ring North numbering 1 to 68 except there are no numbers 13, 53, 55, 57, 59, 61, 63, 65 and 67 but there is a number 1A. 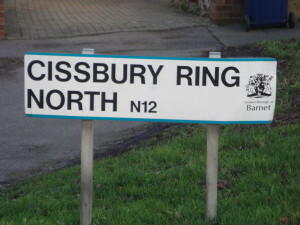 There are ninety-nine houses in Cissbury Ring South numbering 1 to 111 except there are no numbers 13, 44, 56, 75, 96, 98, 100, 102, 104, 106, 108 and 110. Cissbury Ring is the second largest hill fort in England and is a Scheduled Ancient Monument owned by the National Trust. With views of Beachy Head and the Isle of Wight, the area is also rich in wildlife and was the site of Neolithic flint mining. In the Neolithic era, the hill was the most important flint mining area in Sussex. In the Iron Age, the hill fort was constructed around the base of the hill and this was reinforced at the end of the Roman occupation to defend against invading Saxons.. As with many hill forts, Cissbury became a beacon site before being used again for military purposes during WWII when the camp was fortified with gun emplacements. 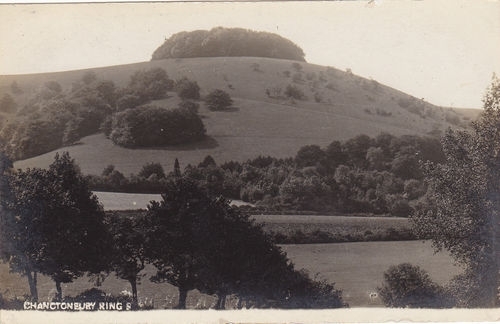 Along with nearby Chanctonbury Ring, the Devil is named as the creator of Cissbury Ring. Whilst digging Devil’s Dyke, he threw clods of earth around which, when they landed, created various earthworks in Sussex including Cissbury Ring, Chanctonbury Ring and Mount Caburn. There is a tale that the fort was created by Caesar himself. In 1663 the fort was noted as being called “Cesars Bury”, later shortened to Cissbury. 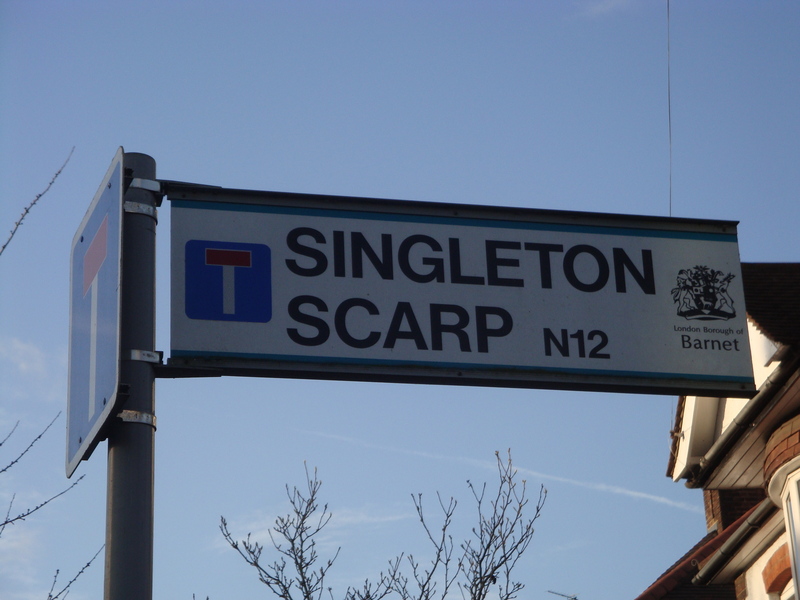 There are twenty-two houses in Lullington Garth numbering 1 to 25 except there are no numbers 3, 4 and 13 but there is a number 1A. Folkington is a village about 6 miles north of Eastbourne in East Sussex. It is mainly farmland and nestles in a valley cut into the Downs on Folkington Road off the A27. 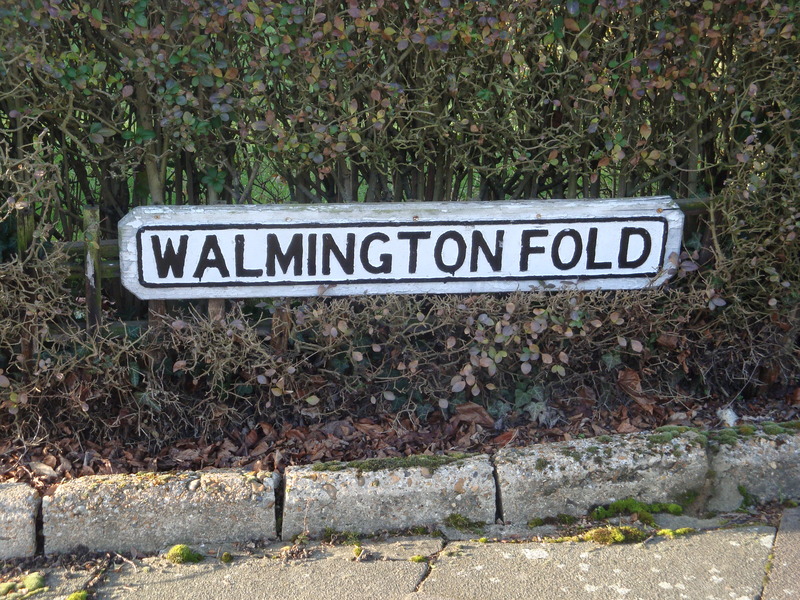 The village is actually pronounced “Fowington” and its history can be traced back to the Domesday Book. 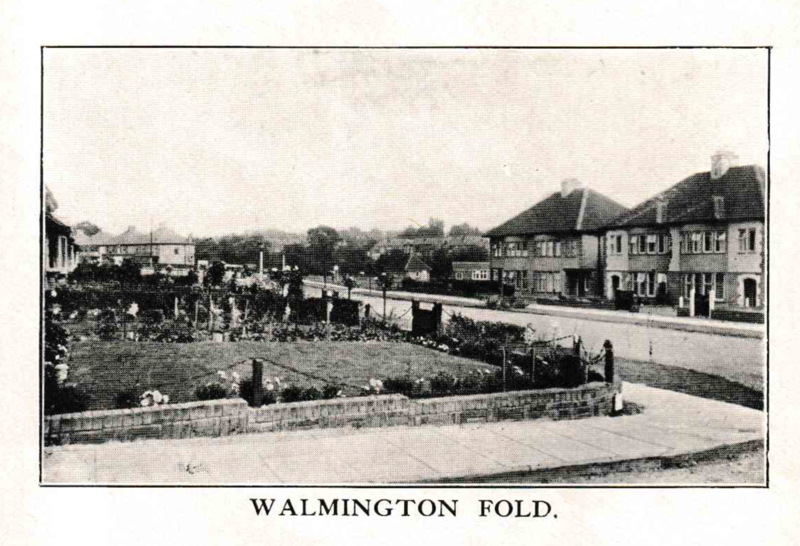 It centres around Folkington Manor and the associated stables and comprises just a few houses and a Church. 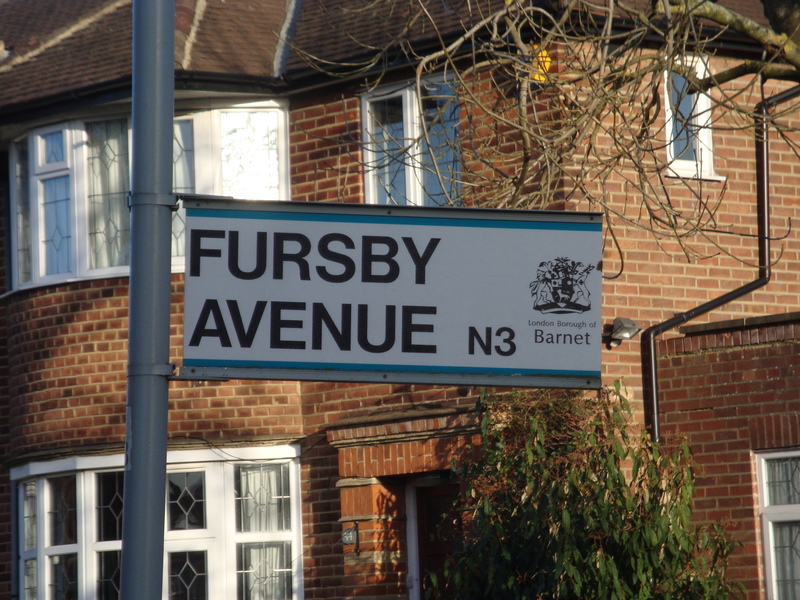 Six houses in Fursby Avenue are located within the Suburb. They are numbers 50, 52, 54, 61, 63 and 65 all of which sit on the west side of Dollis Brook. 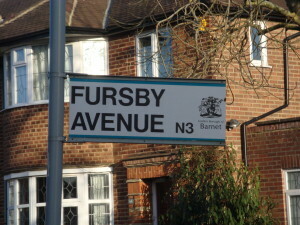 There does not appear to be a village or town called Fursby in the UK! 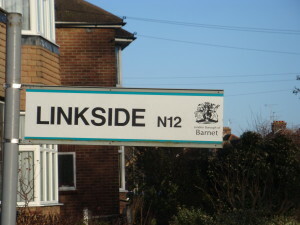 There are seventy-four houses in Linkside numbering 1 to 98 except there are no numbers 13 and no odd numbers from 51 to 97 but there is a number 11A. 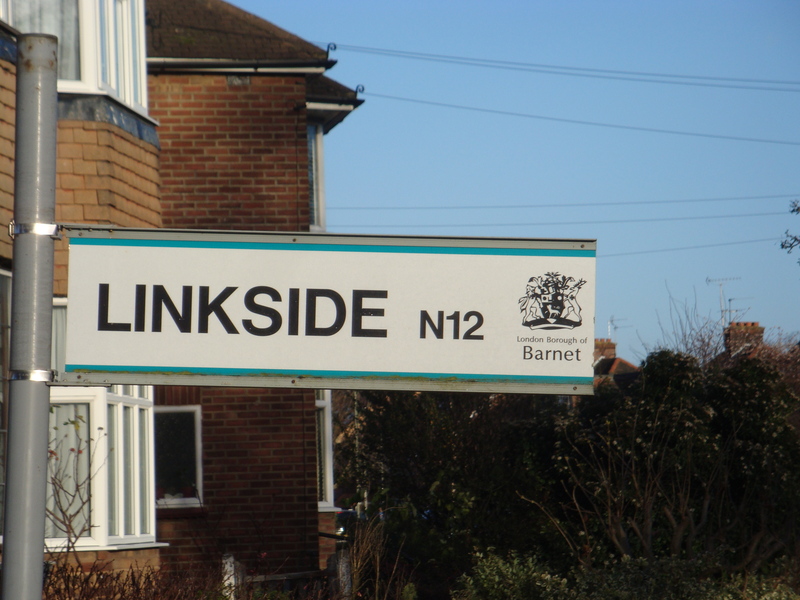 Linkside is not a Sussex village and was named as it is located adjacent to the golf course. 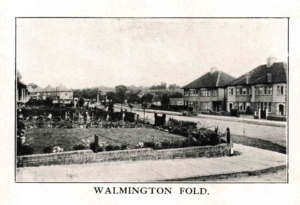 There are eighty-nine houses in Lullington Garth numbering 1 to 90 except there is no number 13. Lullington is a hamlet about 6 miles west of Eastbourne in East Sussex. It lies on a shoulder of the South Downs at the point where the River Cuckmere cuts through the Downs. The hamlet is so small it can be easily missed but it lies in fields between Lullington Road and Chapel Hill off the A27. 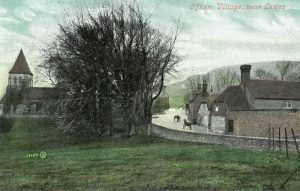 The larger village of Alfriston lies on the opposite bank of the river. There are twenty-nine houses in Offham Slope numbering 1 to 13 except there are no numbers 13 and 25. Offham is an East Sussex village, a couple of miles north of Lewes, lying on the main A275, Lewes to East Grinstead road, close to freshwater ditches and marshes augmented by the river Ouse. The name can originally be found in 9th century history and is derived from the Anglo Saxon word woch-hamm, a crooked water meadow on the river Ouse. It appears as Wogham in the Magna Carta. In 1264 Simon de Montfort passed through the village on his way to the Battle of Lewes, in which his men were the victors over Prince Edward (later to be Edward I) son of Henry III. In 1769, the remains of many people were found during the construction of a new road. They are believed to have been de Montfort’s troops, slain by the King’s cavalry. De Montfort’s reign as the uncrowned King of England lasted little more than a year. The adjacent settlement at Hamsey was abandoned during 1348 when the Black Death forced inhabitants to move away and they moved to Offham. The village effectively remained a farming community for many centuries. In later years, lime and chalk were produced from a quarry nearby. In 1809, William Jessop, the owner of the chalk pit built a tramway to transport the lime and chalk from the quarry down to the barges on the river Ouse. The steep slope was dangerous and costly in terms of the loss of horses, carts and men. At the top of the tramway was a large wheel with a brake. The weight of full trucks of lime and chalk travelling down the hill pulled the empty ones back up the 60% sloped track. This method of transport was used until 1870 when the pit was closed and Offham has been a sleepy little village ever since. 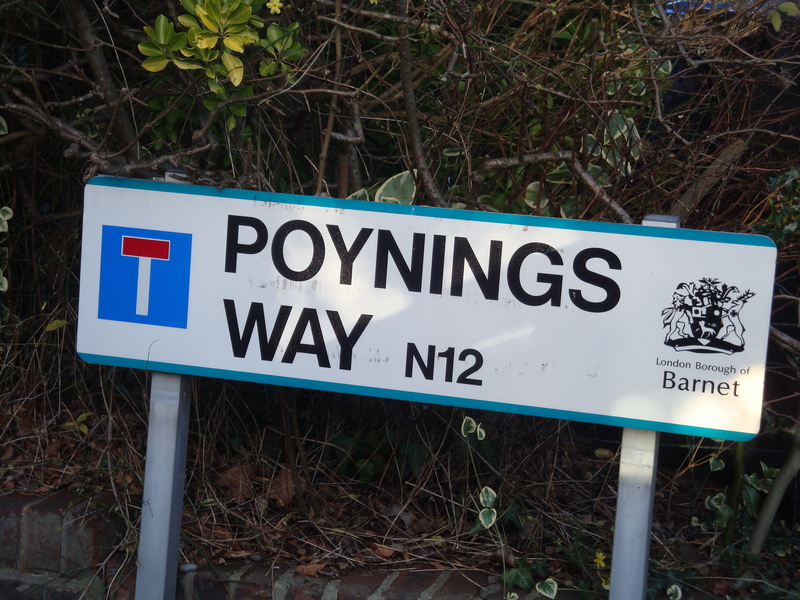 There are sixteen houses in Poynings Way numbering 1 to 19 except there are no numbers 7, 12, 13 and 14 but there is a number 9A. 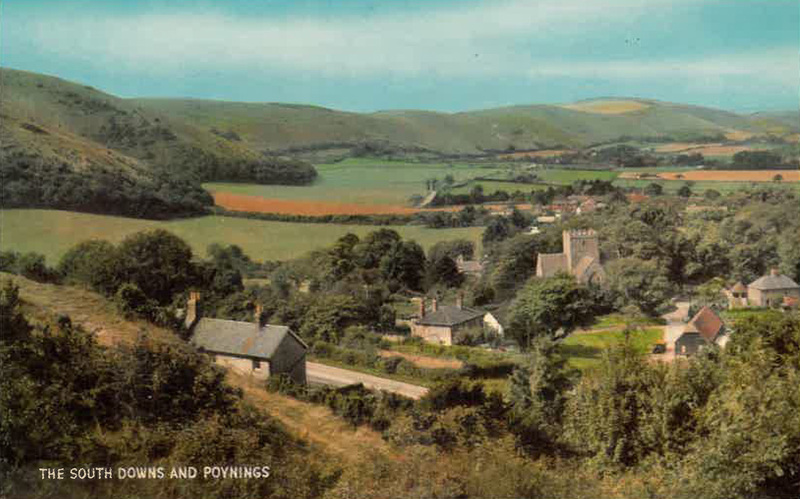 Poynings is a small village lying at the base of the Devil’s Dyke along the north face of the Downs, just north of Brighton. 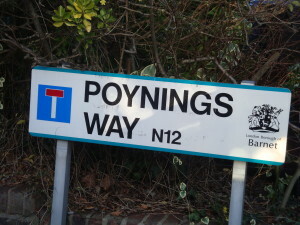 Access to Poynings is south of the A281, off the A23. The village contains a 14th century cruciform Church with 58ft tower and magnificent 15th century stained glass. The brothers Thomas and Richard de Poynings built the church as it now stands in 1370. South and uphill of Poynings is the Devil’s Dyke, a steep mound, surmounted by an Iron Age fort which provides superb views of the South Downs westwards across to Chanctonbury Ring and northwards over the Weald. 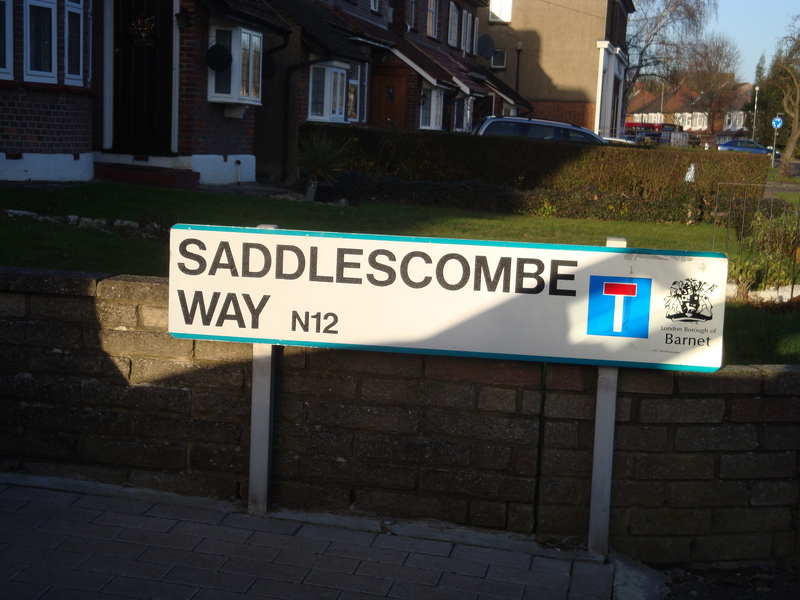 There are twenty-six houses in Pyecombe Corner numbering 1 to 27 except there is no number 13. The most famous aspect of Pyecombe’s shepherding history is the distinctive shepherd’s crook, known as the ‘Pyecombe Hook’, which was crafted in the old Pyecombe Forge. 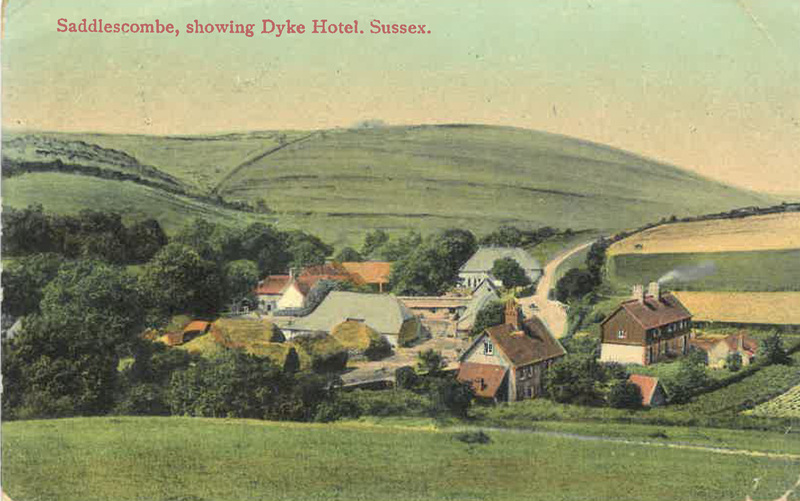 The Pyecombe Hook was very popular amongst shepherds across the depth and breadth of the Sussex Downs in the latter part of the last millennium, One surviving Pyecombe Hook is integrated into the Tapsel gate at the entrance to the Churchyard. The Forge eventually closed and is now a private house. The Saxo-Norman Church, known as the Church of the Transfiguration, is a typical downland village church which can be traced back to the twelfth century. 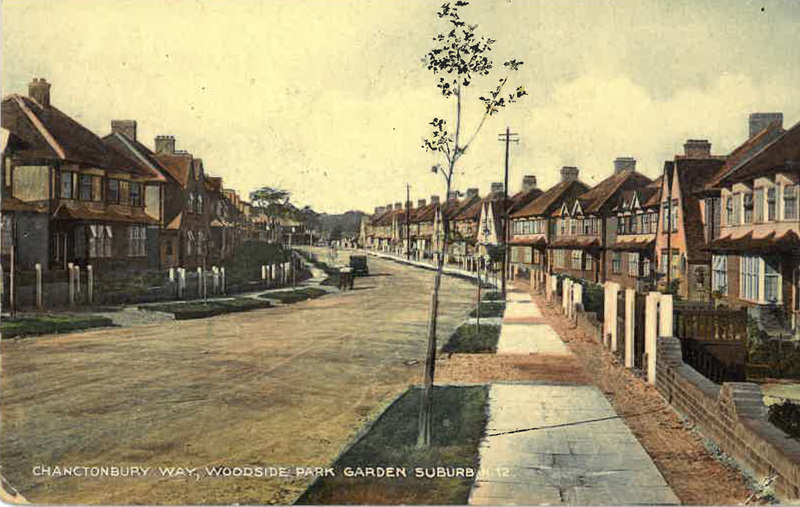 The village suffers from motorway noise and the main London to Brighton railway passes through the Clayton tunnel underneath. The village contains more phone masts than any other village in England (fourteen in total) although such records are there to be broken. However, Pyecombe is a popular destination for walkers, horse riders, and cyclists because of its beautiful setting, easy access to the South Downs Way and many other footpaths and bridlepaths and for being a ‘typical’ downland village. There are also three riding schools in the village which attract experienced riders and novices alike from far and wide. There are eightteen houses in Rodmell Slope numbering 1 to 19 except there is no number 13. Rodmell is an East Sussex village, nearly three miles south-west of Lewes, lying on the Lewes to Newhaven road and on the west bank of the river Ouse. The prime meridian passes just west of Rodmell (that is 0 degrees longitude) and there, the similarity with Greenwich ends. 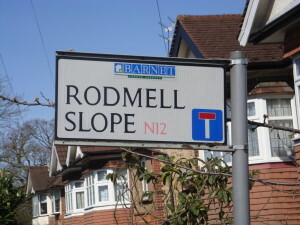 The village name has been variously spelled as Ramelle or Redmelle (11th century), Redmelde (12th century), Radmelde (13th century) and Radmill (18th century). Before the Norman Conquest, the manor of Rodmell was held by King Harold II. Included within the Domesday Book, is the church of St Peter in Rodmell, which was granted to Lewes Priory by William de Warenne, 2nd Earl of Surrey. The nave, south chapel and chancel forming part of the old church still stand today. Monk’s House is located in the village. It was the home of the author Virginia Woolf for twenty-one years until her death in 1941. She left this house for the last time on 28th March 1941, took a walk through the local fields and drowned herself in the nearby river Ouse. 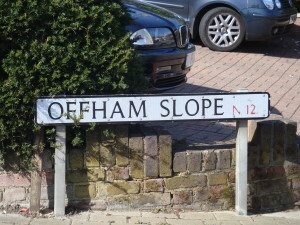 Her husband Leonard Woolf continued to live there until his death in 1969. The house was eventually purchased by the University of Sussex, before being acquired and restored by the National Trust. Breaky Bottom is a valley within the Rodmell parish which produces fine English wine. 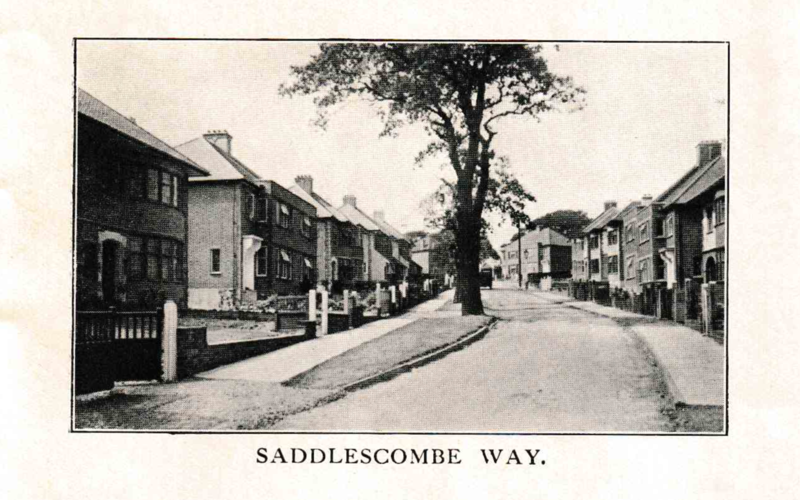 There are twenty-seven houses in Saddlescombe Way numbering 1 to 28 except there is no number 13. 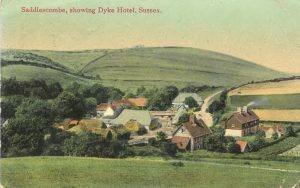 Saddlescombe is the tiniest of hamlets located in the beautiful Saddlescombe Valley, east of Poynings along the north face of the Downs. 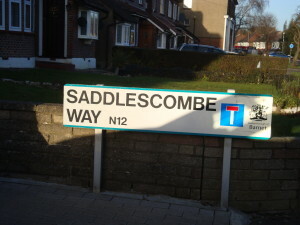 Access to Saddlescombe is south of the A281, off the A23. Saddlescombe Farm is a National Trust property and dates back to the twelfth century when the farm was owned by the Knights Templar. The donkey wheel at the farm draws water from the well which the knights had excavated in the thirteenth century. Saddlescombe is best known for the “Hikers Rest” which is an upmarket catering trailer apparently providing the best food around for hungry walkers. There are no houses in Scaynes Link. Scaynes Hill is a village of about four hundred homes which lies either side of the A272 in West Sussex, about 2½ miles east of Haywards Heath. 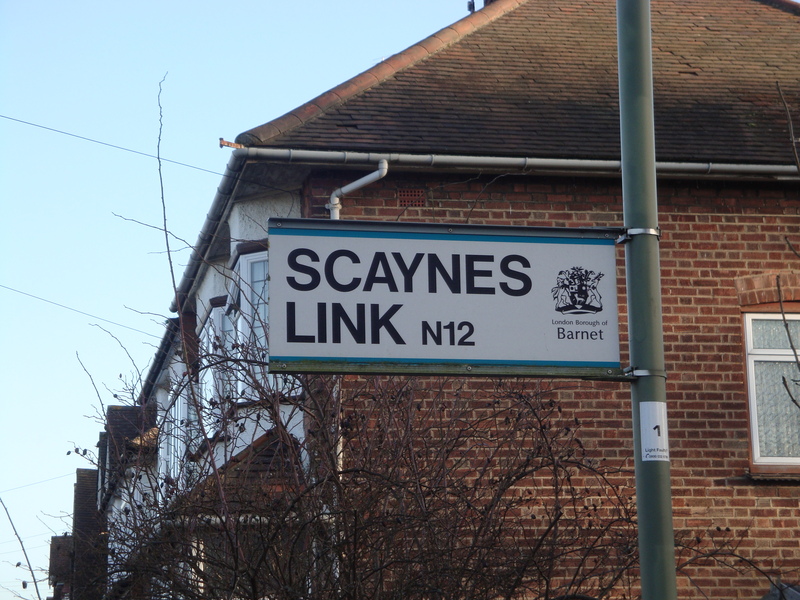 Scaynes Hill is a relatively modern village dating back top the nineteenth century. It contains a disused quarry which is designated as a Site of Scientific Interest. 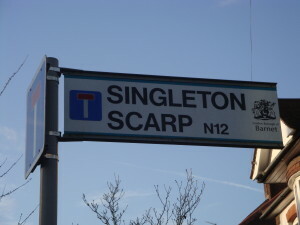 There are thirty-eight houses in Singleton Scarp numbering 1 to 39 except there is no number 13. Singleton is a village nestling in the fold of the South Downs just off the A286 Chichester to Midhurst Road. It is located about ten miles north of Chichester, close to the source of the River Lavant immediately beneath the north slopes of Trundle Hill and a couple of miles north of Goodwood Racecourse. It is worth a visit just to go to the Partridge Inn, a sixteenth century gastro-pub. The Weald and Downland Open Air Museum in the village displays a number of ancient buildings which have been dismantled, transported to the museum and rebuilt. A small nature reserve “Levin Down” lies to the north of the village. A climb to the top of Levin Down gives a magnificent view of Goodwood Racecourse and the Lavant Valley. 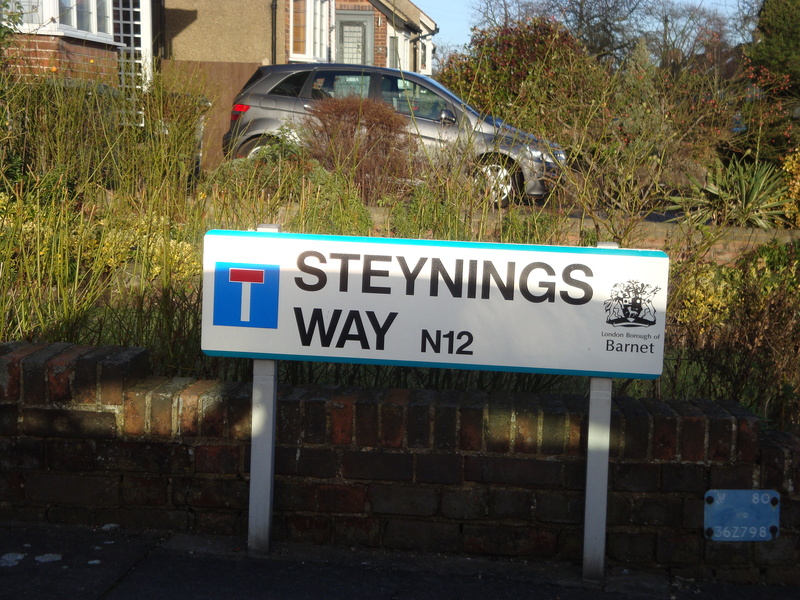 There are eighteen houses in Steynings Way numbering 1 to 19 except there is no number 13. 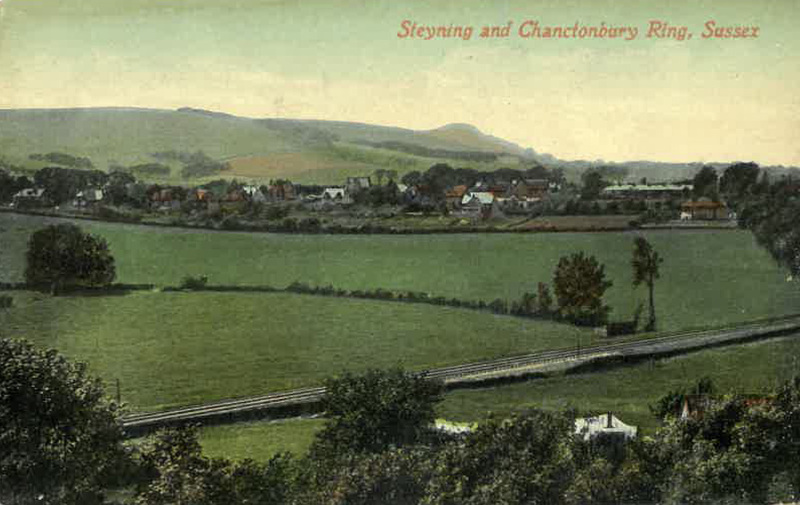 Steyning is a small town, steeped in history, surrounded by the South Downs, just 6 miles from Shoreham-by-Sea and 12 miles from Brighton. The buildings exhibit a rich mixture of style dating back to Norman times. At Steyning’s heart are the timber framed buildings of Tudor and Stuart tradesmen. Subtle changes over the years have only added to their attraction. Steyning has 125 listed buildings. 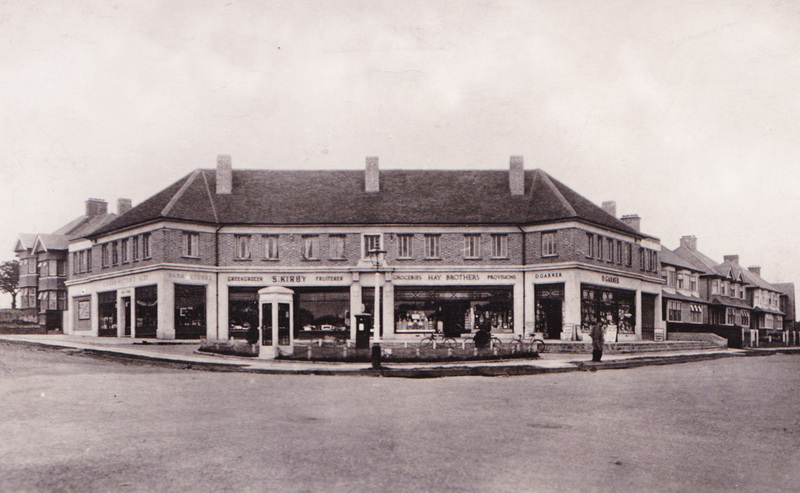 For many centuries a livestock market was held in the High Street, with deals being struck in one of the old coaching inns or the Market House. Church Street is one of the finest and most attractive streets in the whole of Sussex, full of historic interest. Whilst fleeing from Cromwell’s troops towards the safety of France, King Charles II is thought to have tarried nervously at the forge which jostled side by side with the wheelwright, the barrel maker and the inn keepers. 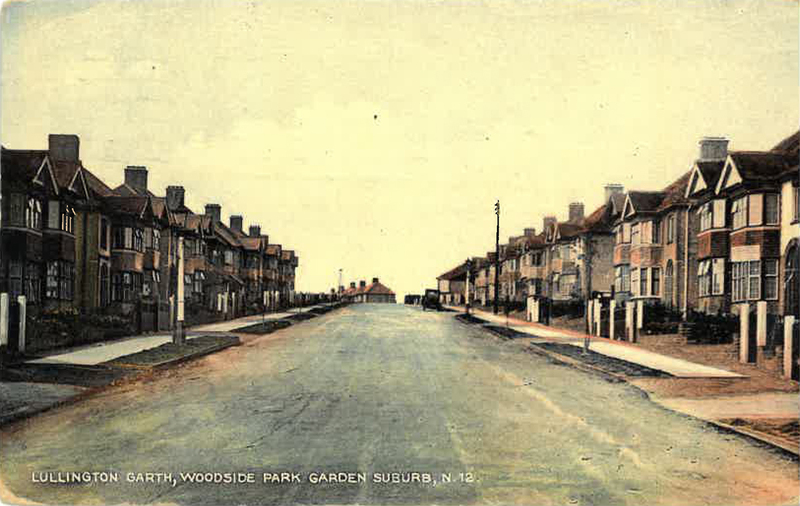 Down the street John Launder was hurried from his prison cell to be burnt for heresy on Chantry Green. In the midst of all this stands Brotherhood Hall, a school for the past 400 years. 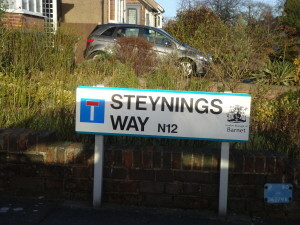 Steyning is a well-resourced town with a cheerful, vibrant community, It is rich in historical and literary associations. Its Norman church contains some of the best Romanesque architecture in England and, in the legends of Saint Cuthman, lies a unique record in the South East of the conversion of a Saxon community. It is the perfect place to explore the downs and weald of central Sussex overlooked by the famous Chanctonbury Ring. There are one hundred and thirteen houses in Walmington Fold numbering 1 to 125 except there are no numbers 13 and even numbers between 108 and 124. Walmington is actually Wilmington and the spelling seems to have been changed somewhere along the journey from Sussex to North-West London because of pronunciation. Wilmington lies on the northern edge of the South Downs, together with a number of other villages including Folkington, just south of the busy A27 Eastbourne to Lewes Road and about twelve miles north-west of Eastbourne in East Sussex. 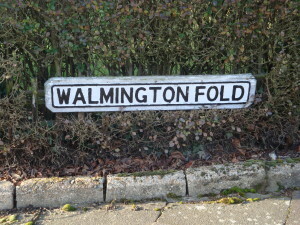 The village derives its name from the Saxon Winel-tone, i.e. the homestead of Winel. The name is recorded in the Domesday Book as Wineltone. Earl Godwin, the father of Harold II (who was killed in 1066 by William the Conqueror), owned all the land in this area including Wilmington. In the late twelfth century a Priory was built at Wilmington by the Abbot of Grestein from Honfleur in France. The village church dedicsted to St Peter and St Mary was constructed slightly later for the local peasants to use. Within the churchyard sits an old Yew tree which is thought to be more than 2000 years old. Its age is starting to show, as it needs wooden poles to hold its branches up – not too dissimilar to some of the trees in Walmington Fold! On the Wilmington Downs lies the giant figure of a man, 235ft high, cut in chalk and outlined with white bricks. It is believed that he existed before the Saxons. However no one has proof of his age. This man is known as “The Long Man of Wilmington “, the mysterious guardian of the South Downs. 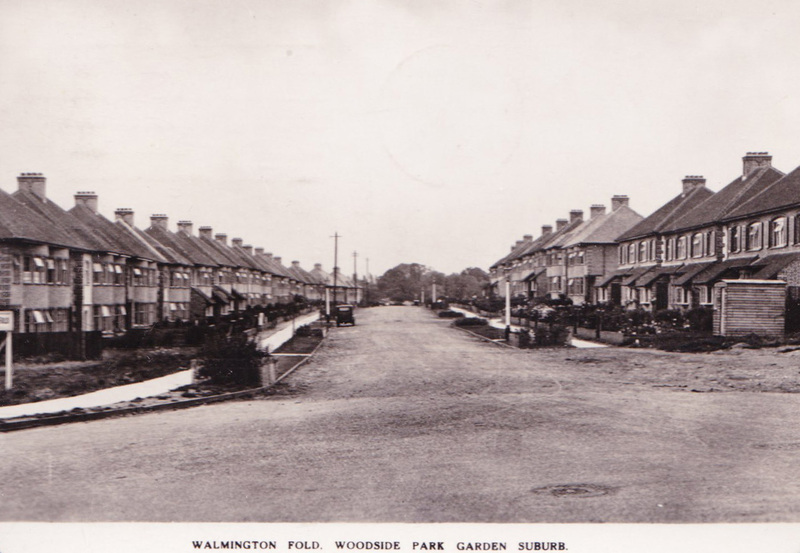 There are twenty-six houses in Wolstonbury numbering 1 to 27 except there is no number 13. Wolsontbury is a chalky hill located within the South Downs National Park close to the village of Pyecombe in West Sussex, about 2½ miles north of Brighton. The only means of access is by foot. The hill is 145 acres in area and rises to a maximum height of 738 ft above sea level. It is designated as a Scheduled Monument and because of its diverse flora and fauna, including some rare orchids, it is also classified as a Site of Special Scientific Interest. Man’s existence at the site dates back to Neolithic times and it is said that King Alfred fought on the hill.